Click here to go to the Japanese page. 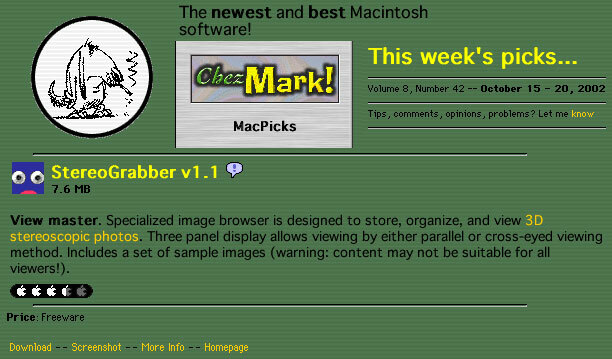 Download Links Now it's Version 1.2 and OSX-ready. 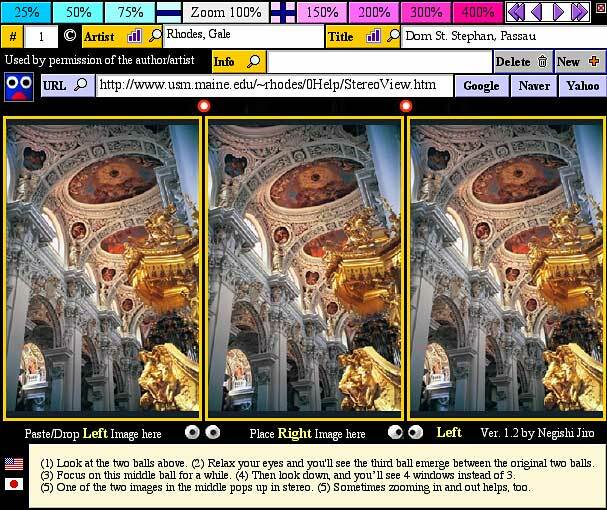 Three instead of two stereo pair images are displayed side by side on each page so that they can be freeviewed either by parallel or cross-eyed viewing method. You can enlarge and shrink the images by zooming in on or zooming out of the images. Parallel-viewing stereoscopic images can sometimes be made easier by shrinking the images. On the other hand if you are good at cross-eyed viewing, you may want to enlarge the images to fully appreciate them. Clicking on the "URL button" opens the web browser and takes you to the linked URL. It even comes with a zoom function!It even comes with a zoom function! Ray Hannisian's masterpiece will be featured in the next version (Version1.2).